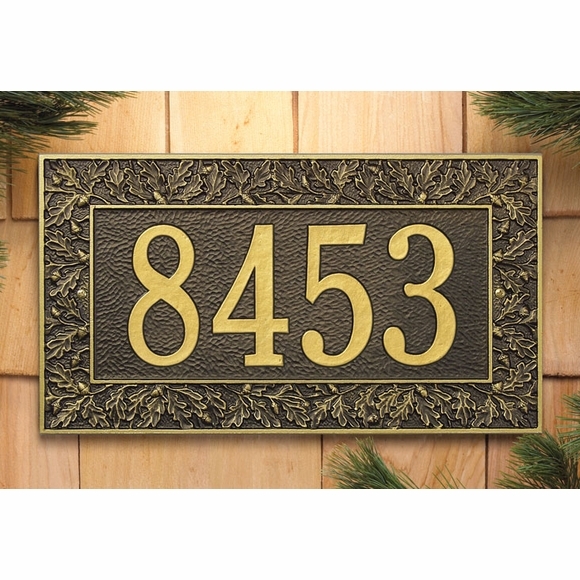 Personalized Oak Leaf Address Plaque - - 16" x 9" rectangle address sign with wide oak leaf border holds one or two lines of personalization. Made in USA. Shown above in bronze with gold letters (main image) and antique copper (smaller image). The one-line version holds up to four 4.5" numbers. The two-line version holds up to six 3" characters on line 1 and up to sixteen 1.25" characters (including spaces) on line 2. Eleven color combinations: AB antique brass, AC antique copper; BG black with gold characters; BS black with silver characters; BW black with white characters; GG green with gold characters; OB oil rubbed bronze; OG bronze with gold characters; PS pewter with silver characters; RG red with gold characters; and WG white with gold characters. Oak Leaf border personalized address sign for wall mount. I was so thankful that my address plaque arrived "as described" - it is beautiful! I was a little hesitant to place a customized order without knowing how it would turn out - but I'm glad I made this purchase!